Hotel Trident Hilton Udaipur, Trident Hilton Hotel Udaipur, Reservation for Hotel Trident Hilton, Udaipur, India. 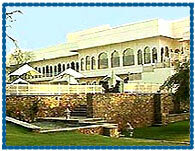 Address: Lake Pichola Hotel, Outside Chandpole, Udaipur - 313001, Rajasthan, India. Accessibility: 28 kms. from Airport, 7 kms. from Railway Station, 6 kms. from Bus Stand. Hotel Trident Hilton Udaipur is located on the banks of Lake Pichola, surrounded by 43 acres of land with lush green landscaping. Hotel offers a perfect base to explore the fabled city of Udaipur, acclaimed worldwide for its medieval palaces, beautiful lakes and colourful bazaars. Hotel offers 143 elegantly appointed and tastefully furnished rooms overlooking the landscaped gardens. All the rooms are equipped with modern facilities like mini-bars, direct dial telephones, data port connectivity, satellite television, electronic safes and tea coffee making facilities. Airline Desk, Baggage Storage, Barber Shop, Beauty Salon, Car Rental Desk, Concierge Desk, Foreign Currency Exchange, Gift Shop, Laundry/Valet Service, Local Area Transportation, Luggage Hold, Room Service, Safety Deposit Box, Audio/Visual Equipment Rental, Cellular Phone Rental, Express Mail, Meeting Rooms, Photo Copying Service, Printer, Secretarial Service, Typewriter, Basketball, Fitness Room, Jogging Track, Playground, Pool Walking Track, Babysitting Service, Cribs.